Thin films with vanishing real part of the dielectric function (Re[ε] = 0) in the mid-infrared (MIR) region are promising photonic materials for manipulating and enhancing IR light–matter interactions at the nanoscale. We present a nanospectroscopic characterization of two fundamental polaritonic phenomena near Re[ε] = 0 by atomic force microscope infrared spectroscopy (AFM-IR): the Berreman mode (BE) in 100 nm SiO2 and Si3N4 films on Si, and epsilon-near-zero (ENZ) local field confinement in a 2 nm native SiO2 layer on Si. AFM-IR is an emerging photothermal technique that provides direct information on nanoscale IR absorption, allowing unambiguous identification of BE and ENZ effects supported by simulations. We demonstrate far-field applicability of polaritonic AFM-IR studies by characterizing a nanoscale plasmonic ENZ grating on Si with 2 nm native SiO2 using polarization-dependent IR microscopy. S. Vassant, J.-P. Hugonin, F. Marquier, and J.-J. Greffet, “Berreman mode and epsilon near zero mode,” Opt. Express 20(21), 23971–23977 (2012). I. Liberal and N. Engheta, “Near-zero refractive index photonics,” Nat. Photonics 11(3), 149–158 (2017). S. Campione, I. Brener, and F. Marquier, “Theory of epsilon-near-zero modes in ultrathin films,” Phys. Rev. B 91, 121408 (2015). Y. C. Jun, T. S. Luk, A. R. Ellis, J. F. Klem, and I. Brener, “Doping-tunable thermal emission from plasmon polaritons in semiconductor epsilon-near-zero thin films,” Appl. Phys. Lett. 105(13), 131109 (2014). A. Röseler, “Spectroscopic infrared ellipsometry,” in Handbook of Ellipsometry, H. G. Tompkins and E. A. Irene, eds. (William Andrew Publishing−Springer, 2005). C. Huck, J. Vogt, T. Neuman, T. Nagao, R. Hillenbrand, J. Aizpurua, A. Pucci, and F. Neubrech, “Strong coupling between phonon-polaritons and plasmonic nanorods,” Opt. Express 24(22), 25528–25539 (2016). T. W. H. Oates, H. Wormeester, and H. Arwin, “Characterization of plasmonic effects in thin films and metamaterials using spectroscopic ellipsometry,” Prog. Surf. Sci. 86(11–12), 328–376 (2011). J. Yoon, M. Zhou, M. A. Badsha, T. Y. Kim, Y. C. Jun, and C. K. Hwangbo, “Broadband epsilon-near-zero perfect absorption in the near-infrared,” Sci. Rep. 5(1), 12788 (2015). A. J. Labelle, M. Bonifazi, Y. Tian, C. Wong, S. Hoogland, G. Favraud, G. Walters, B. Sutherland, M. Liu, J. Li, X. Zhang, S. O. Kelley, E. H. Sargent, and A. Fratalocchi, “Broadband epsilon-near-zero reflectors enhance the quantum efficiency of thin solar cells at visible and infrared wavelengths,” ACS Appl. Mater. Interfaces 9(6), 5556–5565 (2017). A. Espinosa, R. Di Corato, J. Kolosnjaj-Tabi, P. Flaud, T. Pellegrino, and C. Wilhelm, “Duality of iron oxide nanoparticles in cancer therapy: amplification of heating efficiency by magnetic hyperthermia and photothermal bimodal treatment,” ACS Nano 10(2), 2436–2446 (2016). S. Campione, S. Liu, A. Benz, J. F. Klem, M. B. Sinclair, and I. Brener, “Epsilon-near-zero modes for tailored light-matter interaction,” Phys. Rev. Appl. 4(4), 044011 (2015). O. Wolf, S. Campione, J. Kim, and I. Brener, “Spectral filtering using active metasurfaces compatible with narrow bandgap III-V infrared detectors,” Opt. Express 24(19), 21512–21520 (2016). A. S. McLeod, P. Kelly, M. D. Goldflam, Z. Gainsforth, A. J. Westphal, G. Dominguez, M. H. Thiemens, M. M. Fogler, and D. N. Basov, “Model for quantitative tip-enhanced spectroscopy and the extraction of nanoscale-resolved optical constants,” Phys. Rev. B 90(8), 085136 (2014). A. Dazzi and C. B. Prater, “AFM-IR: technology and applications in nanoscale infrared spectroscopy and chemical imaging,” Chem. Rev. 117(7), 5146–5173 (2016). T. Shaykhutdinov, S. D. Pop, A. Furchner, and K. Hinrichs, “Supramolecular orientation in anisotropic assemblies by infrared nanopolarimetry,” ACS Macro Lett. 6(6), 598–602 (2017). J. Kyoung, D. J. Park, S. J. Byun, J. Lee, S. B. Choi, S. Park, and S. W. Hwang, “Epsilon-near-zero meta-lens for high resolution wide-field imaging,” Opt. Express 22(26), 31875–31883 (2014). P. Klenovský, J. Zůda, P. Klapetek, and J. Humlíček, “Ellipsometry of surface layers on a 1-kg sphere from natural silicon,” Appl. Surf. Sci.421, 542(2017). D. J. Shelton, D. W. Peters, M. B. Sinclair, I. Brener, L. K. Warne, L. I. Basilio, K. R. Coffey, and G. D. Boreman, “Effect of thin silicon dioxide layers on resonant frequency in infrared metamaterials,” Opt. Express 18(2), 1085–1090 (2010). K. Hinrichs, A. Furchner, J. Rappich, and T. W. H. Oates, “Polarization-dependent and ellipsometric infrared microscopy for analysis of anisotropic thin films,” J. Phys. Chem. C 117(26), 13557–13563 (2013). K. Hinrichs, K. Roodenko, and J. Rappich, “In situ monitoring of the etching of thin silicon oxide films in diluted NH4F by IR ellipsometry,” Electrochem. Commun. 10(2), 315–318 (2008). F. Lu, M. Jin, and M. A. Belkin, “Tip-enhanced infrared nanospectroscopy via molecular expansion force detection,” Nat. 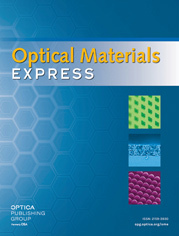 Photonics 8(4), 307–312 (2014). J.-Th. Zettler, M. Weidner, and A. Röseler, “On the characterization of silicon dioxide and silicon nitride by spectroscopic ellipsometry in the VIS and IR regions,” Phys. Status Solidi, A Appl. Res. 124(2), 547–555 (1991). M. Bergmair, K. Hingerl, and P. Zeppenfeld, “Spectroscopic ellipsometry on metallic gratings,” in Ellipsometry at the Nanoscale, M. Losurdo and K. Hingerl, eds. (Springer, 2013). J. Rappich, X. Zhang, and K. Hinrichs, “Electronic properties of Si surfaces modified by aryl diazonium compounds,” in Aryl Diazonium Salts: New Coupling Agents and Surface Science, M. M. Chehimi, ed. (Wiley, 2012). P. Hermann, A. Hoehl, G. Ulrich, C. Fleischmann, A. Hermelink, B. Kästner, P. Patoka, A. Hornemann, B. Beckhoff, E. Rühl, and G. Ulm, “Characterization of semiconductor materials using synchrotron radiation-based near-field infrared microscopy and nano-FTIR spectroscopy,” Opt. Express 22(15), 17948–17958 (2014). Fig. 1 (a) Dielectric function of electrochemically grown SiO2 in MIR region with marked 1211 cm−1 position where Re[ε] = 0 and Im[ε] = 0.73. (b) Schematic of far-field IR polarimetry at AOI = 70°. (c) P-polarized reflectance Rp(70°) showing silicon dioxide stretching vibration ν(SiO2) and BE mode of thermally grown 100 nm SiO2 on Si. Fig. 2 Simulated E⊥ (a) and absorption (b) in a 100 nm SiO2 film on Si under p-polarized illumination at AOI = 70° showing propagating BE mode at 1234 cm−1 at a fixed point in time. Fig. 3 Time-averaged simulated ν(SiO2) (a) and homogeneous 1234 cm−1 BE (b) absorption in a 50 nm SiO2 film on Si under p-polarized illumination at AOI = 70° in the presence of gold AFM tip apex. Corresponding simulations without the tip are shown in (c) and (d), respectively. Fig. 4 Normalized AFM-IR spectra of thermally grown 100 nm SiO2 (a) and Si3N4 (b) films on Si indicating strong tip induced absorption at ν(SiO2) and ν(Si3N4), and the non-invasively probed BE absorption. The insets show zoomed-in BE regions. The noise is due to MIR transparency of Si. Fig. 5 Simulated tip induced ν(SiO2) (a) and 1229 cm−1 ENZ (b) absorption in a 5 nm SiO2 film on Si under p-polarized illumination at AOI = 70° according to Fig. 3(a,b). (c) Schematic of AFM-IR of a 2 nm native SiO2 layer on Si with indicated dimensions of the simulated absorption monitor. (d) Corresponding cascaded and normalized simulated absorption (top) and AFM-IR amplitude spectra (raw and Savitzky–Golay filtered, bottom) showing dominating ENZ local field confinement. Fig. 6 (a) SEM image of gold grating on Si with 2 nm native SiO2 layer. The dimensions are P = 800 nm, L = 330 nm. In-plane polarization indications and azimuth angles are marked. (b) Schematic of homogeneous modification of the grating with 12 nm NB layer. (c) Offset-corrected azimuthally (a) anisotropic reflectance by polarization-dependent IR microscopy. ENZ and BE modes of native SiO2 and the near-field enhanced NO2 modes of NB are marked. Fig. 7 (a) Simulated p-polarization-dependent total absorption of the grating at AOI = 17° where ENZ and BE are at 1217 cm−1 and 1234 cm−1, respectively. (b) Simulation of in-plane plasmon induced E⊥ at AOI = 0° showing unit cell distribution of dipolar ENZ local field confinement in SiO2. (2) λ(BE)= 2π/ k || (BE) = 2πc ω(BE)sin70° =8.62 μm.